Bard on the Beach was established in 1990 with a mandate to provide Vancouver residents and tourists with affordable, accessible Shakespearean productions of the finest quality. Begun as an Equity Co-op, Bard is now a fully professional company engaging dozens of talented artists, artisans, technicians and year-round administrators. Bard’s primary focus is its annual festival in Vanier Park, which annually attracts over 100,000 people. Bard’s other key elements include education and training initiatives for both the artistic community and the general community at large. To perform, explore and celebrate the genius of William Shakespeare. 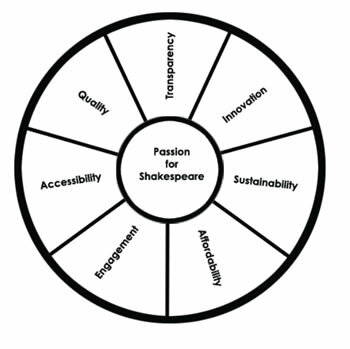 Central to our values is a passion for Shakespeare. Our other values derive from and support that passion, and all have equal worth and energy. While some values necessarily challenge one another, it is in their balance that the circle remains whole and the wheel has momentum.